Dr. Albert L. Reyes is President and CEO of Buckner International, a non-profit international ministry that transforms the lives of orphans, vulnerable children, families and elders. He is the sixth President and CEO of the 139-year-old organization based in Dallas, Texas. He previously served as President of Buckner International and President of Buckner Children and Family Services. Prior to his service at Buckner, Reyes was president of Baptist University of the Américas in San Antonio. 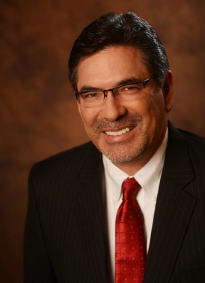 Reyes also has served as pastor of three churches and was involved in numerous roles within the Baptist General Convention of Texas, serving as its President in 2005. He currently is a member of the Board of the Christian Alliance for Orphans (CAFO). Reyes received a bachelor of business administration degree from Angelo State University and master of divinity and doctor of ministry degrees from Southwestern Baptist Theological Seminary. He also earned a doctor of philosophy degree from Andrews University. He is the author of “The Jesus Agenda: Becoming an Agent of Redemption” (Believers Press, 2015). Reyes and his wife Belinda have three adult children and belong to Park Cities Baptist Church in Dallas.